"No charm was lost when this UNIQUE 2 Storey duplex was FULLY RENOVATED! Open concept Main Floor layout features a sunny living room, cozy dining area with a corner fireplace and an UPDATED kitchen with stainless steel appliances and plenty of counter space! Upstairs is home to the Master bedroom with it's own 4 pce ensuite, 2 other good sized bedrooms and a full bathroom. Plus, there is a 3rd level that can be developed for even more usable space! The basement is partially developed, roughed in for a bathroom and houses the laundry room and lots of storage space. Great neutral paint tones and the beautiful hardwood throughout make the home easy to decorate. Backyard is FULLY FENCED and private. Perfect property for someone who wants to live on one side and rent out the other - or rent out both! 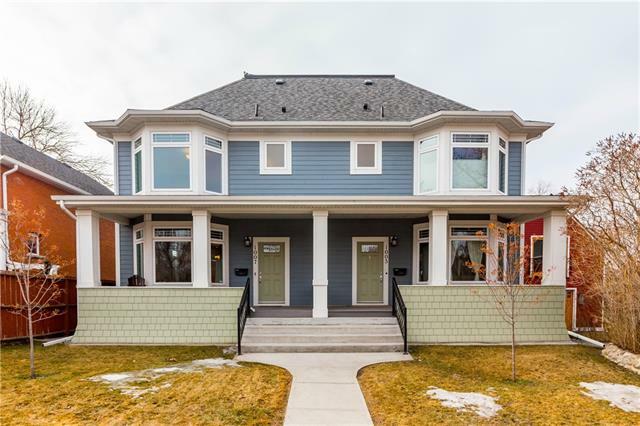 Located in the vibrant downtown community of Ramsay, this fabulous home is close to shopping, restaurants, schools and great City views! DON'T MISS OUT on your chance to own this amazing property!"